...and a cup of good cheer. Just 15 more sleeps until Christmas! 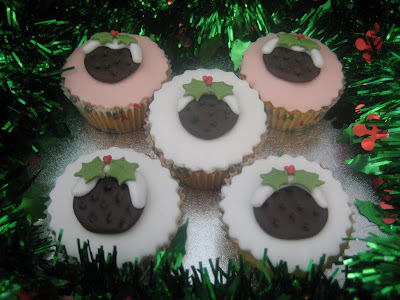 Ok, not quite a Figgy Pudding these are Plum Puddings, although I don't know if they look very different. 1. Roll a ball of brown sugarpaste (fondant) and flatten. Press a piping nozzle into the sugarpaste to make currants. 2. 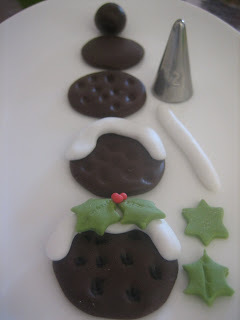 Roll a sausage of white sugarpaste and put this over the top of the pudding. Try your best to make it look like the sauce is dripping down the sides. I was thinking you could use yellow sugarpaste for a more custard look. 3. Roll some green sugarpaste and cut to make holly leaves. For big holly leaves you can use a straw. I used a really small 6 pointed star cutter and shaped to look like holly. Add leaves to the pudding. 4. 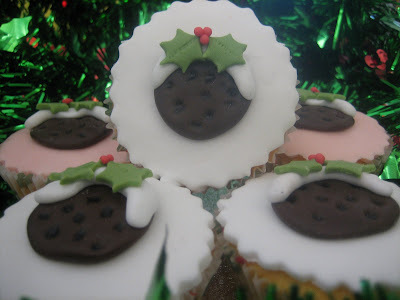 Roll tiny red sugarpaste balls and put on top of holly leaves. 5. Use a small brush to paint black food colouring onto the currants. 6. Transfer to cake when dry. Those are just too precious! They are too pretty, the way you explained in picture is also too good. Those are just sooo cute. What a nice blog you have! Exquisite! They are almost too pretty to eat. Those are calling out to be a center piece on a Christmas table. They are darling.